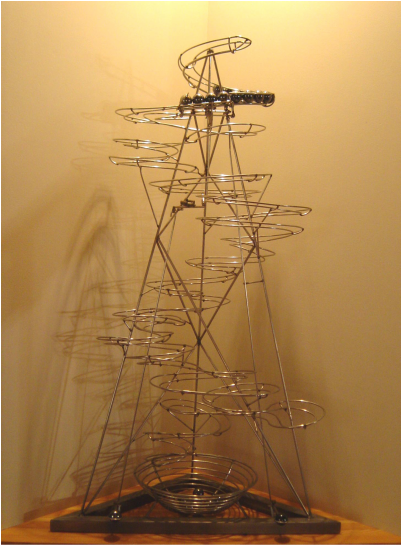 This interactive sculpture features one, hand-loaded track that weaves around and through the pyramid structure, ending in a spiral collector. This sculpture blends geometric shapes with organic composition and movement. The interactivity comes from the ball-release mechanism. There are two levers at the base of the sculpture. One lever releases a single marble as desired, the other lever releases marbles in tight groups of four. One of the other unique aspects of this sculpture is the spiral collector. The spiral collector acts as a marble storage and collection area, while adding visually compelling movement. My future sculptures will incorporate the spiral collector for both hand-fed and motorized small scale sculptures of this design. Cascade is part of a private collection and was completed in 2003. The sculpture is 22" wide, 12" deep, and 40" tall. This piece was specifically designed to work in harmony with the triangular space and overhead illumination of the space where it is displayed. Cascade has a beautiful flowing motion even when not in action.